Some Android users have experienced issues with microSD cards after upgrading to Android 6.0 Marshmallow. These have thankfully been few, but that doesn’t make it any easier on those who are having troubles. Fortunately, there are a couple of things you can try to fix the SD card read error after upgrading to Android 6.0 Marshmallow. One of the simplest fixes takes only a couple of seconds. 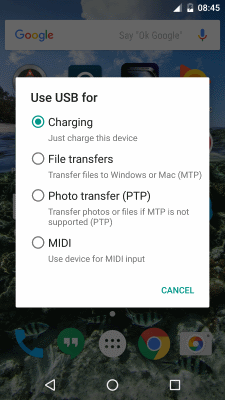 Marshmallow users now have options when charging their phone via USB connected to a computer. You get to select Charging, File transfers, Photo transfer or MIDI. 1. Plug your device into a USB cable connected to a computer. 2. Tap the USB charging panel on the device and select File Transfers. 3. Tap the panel once more and select Charging. While simple, many users have found that by switching the charging mode, the SD card is accessed by the computer and the phone and remains working. One of the major issues once the upgrade is complete is conflicting data in the device cache. So let’s clear it all out. 1. Navigate to Settings then Internal storage. 2. Select Cached data and confirm to clear cached data. 3. Let the process complete and retry. If that didn’t work, we should try clearing the system cache. 1. Turn your Marshmallow device off. 2. Hold down the volume down and power button simultaneously until you see the Android logo appear. 3. Navigate to Wipe cache partition using volume keys to move and power button to select. 4. Reboot your device and retest. Clearing the system cache fixes most upgrade errors so is well worth doing when you upgrade any Android OS. How to fix android.process.media error on Galaxy S5, along with no media sound? I get authentication error on my cell phone at home that I share with others. What do I do?